Anyhow, I am excited to add this little O Antiphon House to our traditions this year. 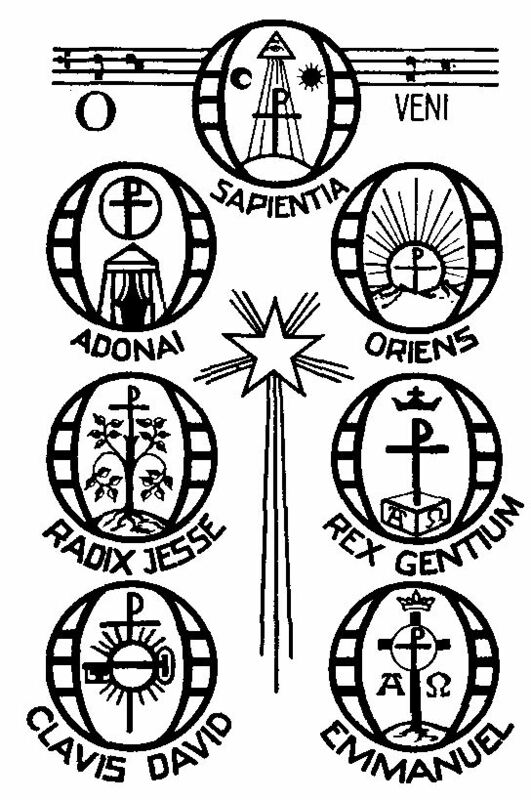 In the past we have just hung an ornament on our Jesse Tree representing each of the O Antiphons and then presented the family with a special gift or activity each evening. I was inspired to make this last year, from a thread on the 4 Real Forums. 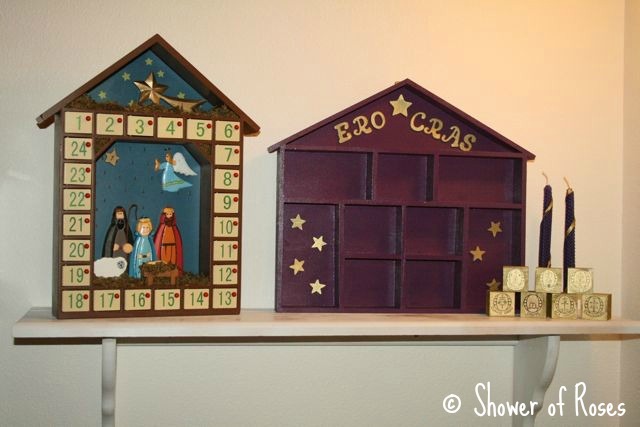 The girls helped me spray paint the house and blocks during "H" Week and I finally finished it up in time for Advent. I ended up keeping it very simple, but am happy with how it turned out. 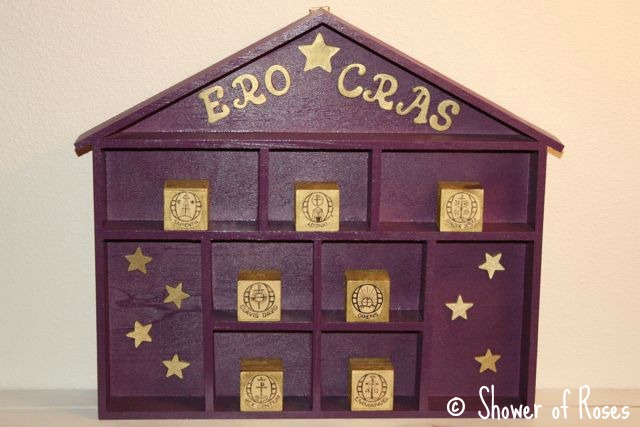 I only wanted to have 7 empty slots for the 7 blocks (representing each of the O Antiphons), so I filled in the two side boxes with 7 painted wooden stars and the top with the words "Ero Cras" which means "Tomorrow, I will come!" The Benedictine monks arranged these antiphons with a definite purpose. If one starts with the last title and takes the first letter of each one - Emmanuel, Rex, Oriens, Clavis, Radix, Adonai,Sapientia - the Latin words ero cras are formed, meaning, “Tomorrow, I will come.” Therefore, the Lord Jesus, whose coming we have prepared for in Advent and whom we have addressed in these seven Messianic titles, now speaks to us, “Tomorrow, I will come.” So the “O Antiphons” not only bring intensity to our Advent preparation, but bring it to a joyful conclusion. 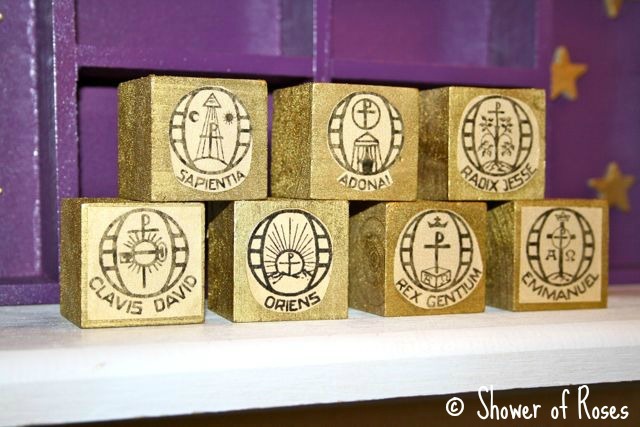 For the blocks, I printed out an image of the O Antiphons reduced to 45% on Gold paper and (very carefully using Mod Podge) glued them to the blocks. I think I may add the dates to the back, turn them around, and stack them in the side boxes with the stars until each day approaches, but for now they are just stacked next to the house ready and waiting for the 17th of December! Beautiful. Sorry for all your contractions. Any day now!! Where o where does one find the house? I'm not sure where else in MN to look! I've been to Michael's, Crafts Direct and Jo-Ann's. My blocks are all ready with no where to go! This came out beautifully!!! Hang in there. Where did you get those letters? That was exactly what I had in mind, and I looked EVERYWHERE for them! I resorted to stickers, but it worked out fine. I just have to print the labels. I like that you used the big blocks...mine are a bit smaller to fit under the titles. We're having brunch on St. Lucia's feast for the recipients of the ones I made...then I will post pictures. I hope you are resting...hang on, little Rose...one more week! Tracy ~ I purchased ours at Michaels. (It's a "Don Mechanic Enterprises® Large Wood Shadow Box") I hope that helps! As for the blocks, ours measure 1 1/2". Aimee ~ The letters are from either Michaels or Wal Mart... I really can't remember. I purchased them back when I was decorating the girls room. They didn't work for what I had purchased them for, but remembering the O Antiphon houses (Ruth's I think) I had decided to save them... The more I think about it I am pretty sure they were from Wal Mart... They came in a small container that had the whole alphabet with some duplicates, a heart, a star (which I used in between Ero and Cras), and a couple other shapes. Jessica, are you already due??!!!! That happened so fast. (For me!) Hugs to you. It's hard I know, but try to rest as much as you can. Your little one will be here before you know it. Sweet blog, I hadn't noticed showerofroses.blogspot.com earlier in my searches! This is a inquiry for the webmaster/admin here at showerofroses.blogspot.com. Can I use some of the information from your post above if I provide a link back to this site? William ~ I don't mind if you quote my blog, providing a link of course, but please do not repost any pictures. Thank you for asking! Did you purchase the house premade? Yes, I purchased it at Michaels and then painted it purple.